There have been a few more data products produced for this earthquake (that has not had any aftershocks). IRIS has produced some educational material, called “teaching moments” (or, could be called, learning moments, heheh). However, their data are often poorly developed, using simplified and incorrect maps. For example, take a look at the pdf linked to their page (or the zipped ppt file) and you will see that they use the USGS plate boundaries for this region, which are not correct (a brief literature review shows this to be the case: even though there are still differences between authors of different papers, the USGS fault lines do not agree with any of them). Here is their page. Below are two animations that show visualizations of seismic waves propagating through the USArray (an array of seismometers, largely paid for my the economic stimulus at the beginning of the Obama administration). I place a screenshot of the animation above each animation. This first animation shows the vertical (z) motion as recorded by seismometers throughout the continental USA. The seismograph below the map shows the seismic waves as recorded at the seismometer highlighted in yellow on the map. This second animation shows the three component (Z, N-S, E-W) motion as recorded by seismometers throughout the continental USA. The seismograph below the map shows the seismic waves as recorded at the seismometer highlighted in yellow on the map. Here is a photo of the seismograph from the Humboldt State University, Dept. 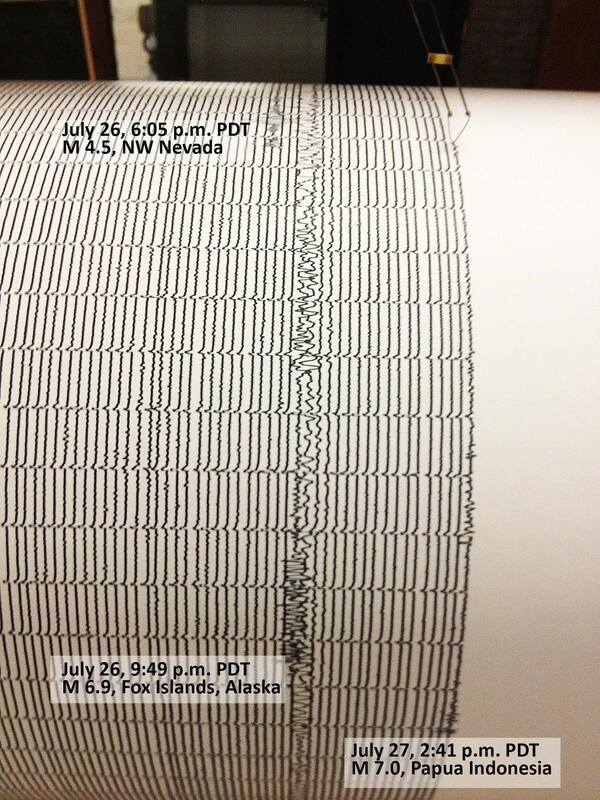 of Geology, Benioff Seismometer (via their facebook page). 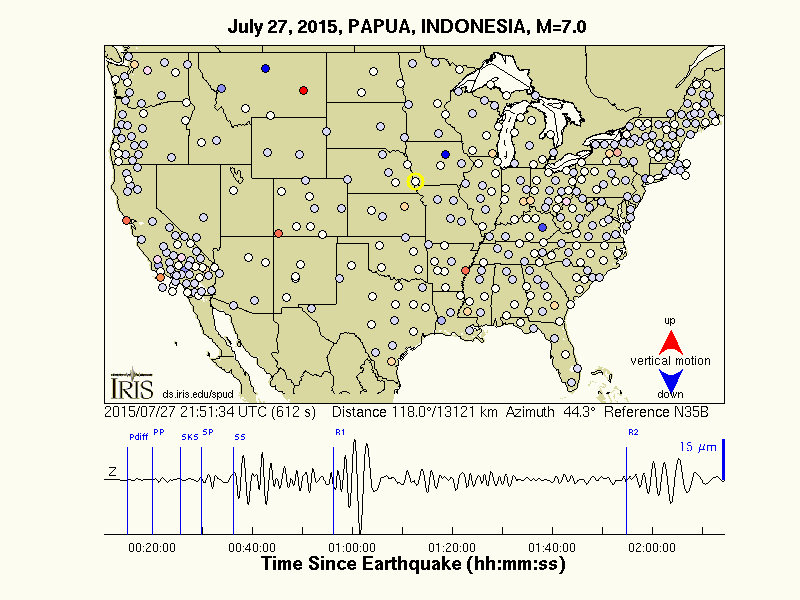 The New Guinea M = 7.0, the Nevada M = 4.5, and the Alaska M = 6.9 earthquake are all shown. 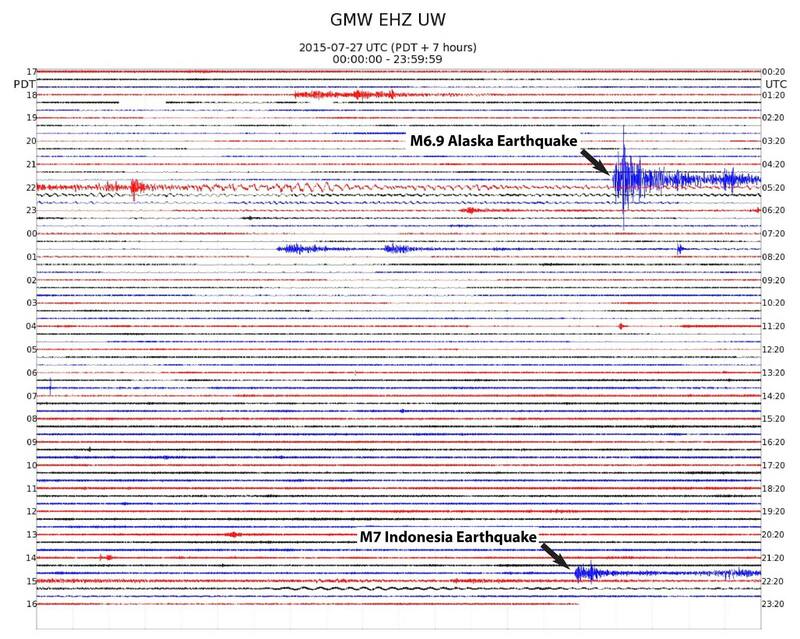 Here is a screenshot of the seismometer data from the Pacific Northwest Seismic Network, via their facebook page. 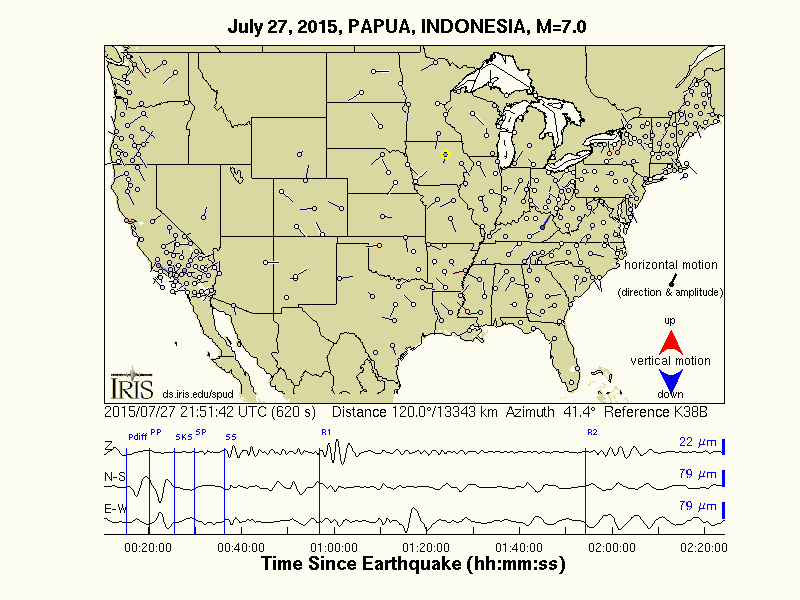 The New Guinea M = 7.0 and the Alaska M = 6.9 earthquake are both shown.